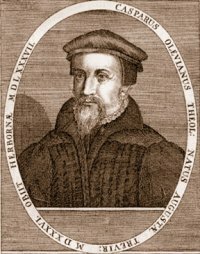 In Zacharias Ursinus' Commentary on the Heidelberg Catechism, he explains law/gospel distinctions. I find this immensely helpful in light of a presentation I gave in a class of mine against a New Perspective on Paul article by Michael Cranford which can be found here. III. In What Does the Gospel Differ From the Law? 3. In the promises. The law promises life to those who are righteous in themselves, or on the condition of righteousness, and perfect obedience.”He that doeth them, shall live in them.” “If thou wilt enter into life, keep the commandments.” (Lev. 18:5. Matt. 19:17.) The gospel, on the other hand, promises life to those who are justified by faith in Christ, or on the condition of the righteousness of Christ, applied unto us by faith. The law and the gospel are, however, not opposed to each other in these respects: for although the law requires us to keep the commandments if we would enter into life, yet it does not exclude us from life if another perform these things for us. It does indeed propose a way of satisfaction, which is through ourselves, but it does not forbid the other, as has been shown. 4. They differ in their effects. The law, without the gospel, is the letter which killeth, and is the ministration of death: “For by the law is the knowledge of sin.” “The law worketh wrath; and the letter killeth.” (Rom. 3:20; 4:15. 2 Cor. 3:6.) The outward preaching, and simple knowledge of what ought to be done, is known through the letter: for it declares our duty, and that righteousness which God requires; and, whilst it neither gives us the ability to perform, nor points out the way through which it may be attained, it finds fault with, and condemns our righteousness. But the gospel is the ministration of life, and of the Spirit, that is, it has the operations of Spirit united with it, and quickens those that are dead in sin, because it is through the gospel that the Holy Spirit works faith and life in the elect. “The gospel is the power of God unto salvation,” &c. (Rom. 1:16.)"